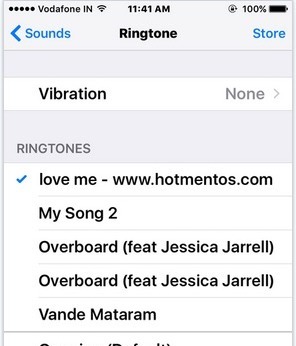 Make iPhone ringtone from a full song (Hollywood or Bollywood mp3 song); you can create or make custom ringtone for iPhone as your caller tone on your iPhone running on latest iOS. Choose the part of the song and set it as a ringtone using iTunes without any jailbreak or Third party software/ Apps. Learn how to crop the selected portion of the song, Set custom tone as a ringtone, way to do this might be long but very simple by following the below steps carefully in step by step. Here I choose Justin Bieber full mp3 song and want to set 30-sec ringtone on my iPhone XS running on iOS 12. But also useful and worked for any generation iPhone model. Prepare ringtone for iPhone: Ringtone length must be less or equal 30 sec. Step 1: Keep a copy of the song on your drive from that you want to make ringtone. Right click on song > Open With > iTunes. The song will be played in iTunes, Go to iTunes and Find song Under the playlist. Go to the iTunes on your Mac/ PC. Step 2: Under the Playlist, you can see the song, Right click on it and Click on get info. Again Right click on song > Create AAC version. Another copy of song automatically added in playlist right below of original song. Then, Right click on new 30-sec song > Show in Finder. Now move it on Desktop. Copy song from Desktop ,Then Go to Finder > Music (Right Sidebar) > iTunes > iTunes Media > Automatically Added to iTunes. Paste it here. Connect your iPhone to iTunes using Lighting cable; Your iPhone will show top tab, click on it to see all the media folder from the right pane. Now Click on Tones under your device name, Checkmark recently added ringtone and tap on Done. Now iTunes automatically sync and added into Setting > Sound > Ringtone > Custom ringtone with Name. Here I created/ make iPhone ringtone from a full song on macOS with latest iTunes and iPhone running the newest iOS. If you want custom ringtone iPhone without computer or custom ringtone iPhone without iTunes, then try with GarageBand. custom ringtones iPhone 4s/ iPhone 5S, iPhone 6/ 6 Plus, iPhone 7 Plus, iPhone 8 Plus, iPhone X, iPhone XS Max, iPhone XS, and iPhone XR. If you haven’t any problem on a set custom ringtone on iPhone/ make iPhone ringtone from the full song, Then share with us. Without iTunes, you can create and set from GarageBand easily.